Reinhold’s Elementary Philosophy is the first system of transcendental philosophy after Kant. Thescholarship of the last years has understood it in different ways: as a model of Grundsatzphilosophie, as a defense of the concept of freedom, as a transformation of philosophy into history of philosophy. 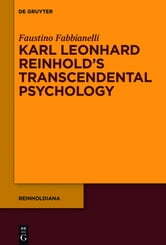 The present investigation intends to underline another ‘golden thread’ that runs through the writings of Reinhold from 1784 to 1794: that which sees in the Elementary Philosophy a system of transcendental psychology.